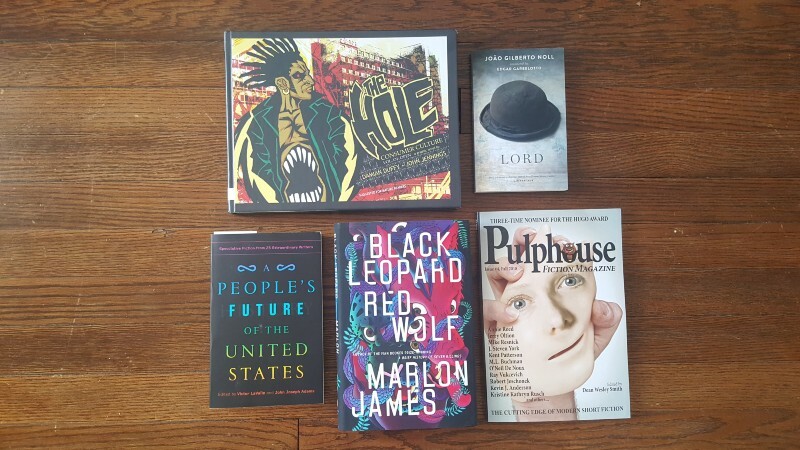 This week brought in a couple of books which I have been looking forward to for months. 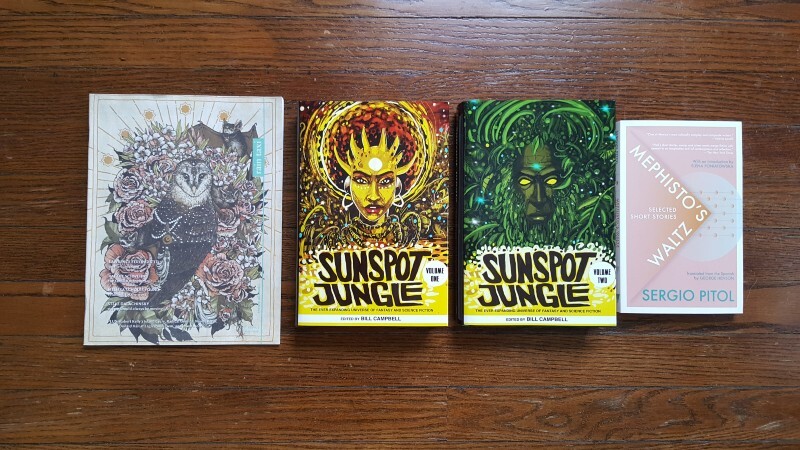 Sunspot Jungle, the two-volume exclusive-to-Kickstarter hardcover set by Rosarium Publishing, arrived by mail yesterday, and they are stunning! I’ll get into the set in a moment, but first, here is the rundown of this week’s acquisitions. On the left is the Winter 2018 issue of Rain Taxi, which I became aware of when their article about Lawrence Ferlinghetti appeared on LitHub last week. On the right is the latest book from Deep Vellum, Mephisto’s Waltz by Sergio Pitol. I first heard of this project when Bill Campbell, owner of Rosarium Publishing, announced the Kickstarter campaign back in the early part of 2018. I supported the pledge on the first day and the rest has been a year of eager anticipation. I first heard of Rosarium when John Scalzi posted a photo of one of his weekly stacks of new books, and in that stack was a small collection of short stories called The Assimilated Cuban’s Guide to Quantum Santeria. That, of course, is one hell of a title. And Rosarium is one hell of a publishing company. In reading news, the past week was hectic, what with the polar vortex and associated schedule disruptions. I did make significant progress through Reckoning #1, and am a couple of chapters into T L Greylock’s The Blood-Tainted Winter. In other literary news, I am back in the saddle at Caffeinated Press after a year-long hiatus/sabbatical, and am hard at work assembling the next issue of The 3288 Review. Amazing how a schedule disruption, even one which ostensibly frees up a chunk of free time, seldom actually results in more usable free time.